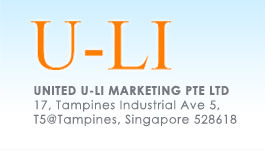 United U-Li Marketing Pte Ltd is a wholesaler and distributor of Electrical and Electrical Hardware product serving both local and international customers since 2003. We represent 'U-LI' for its Cable Support System (Cable Ladder, Cable Tray and Cable Trunking), Metal framings and accessories and also its Floor Trunking System (Underfloor Trunking, Flushed Floor Trunking and Raised Floor Trunking). These products are manufactured by United U-LI Sdn Bhd, a listed company in Malaysia. We also represent STUBE for its Conduits (Class 3 and 4), Conduit Accessories, Flexible conduits and accessories, Brass accessories etc. These products are manufactured in China, India and Malaysia, quality controlled by our team of committed staff. We work closely with our network of Dealers, Traders, Consultants and Contractors to bring quality products to our customers. With the ISO 9001:2008 system in place, we are confident that we will be able to serve you better.